Tonight I finally got around to making a soup from The Ultimate Soup Bible, a cookbook we got from Lisa’s brother at Christmas. 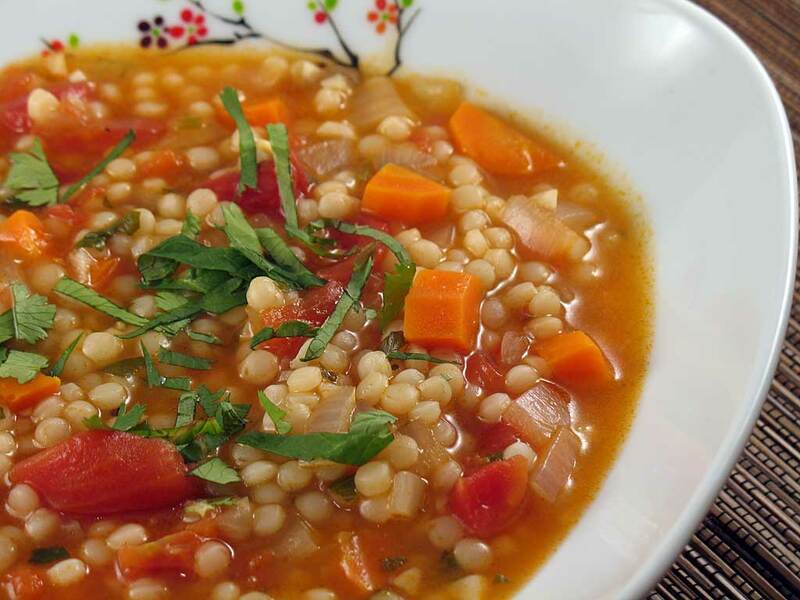 This easy to make tomato soup is made with Israeli couscous (which is much larger and chewier than regular couscous), onions, tomatoes, garlic, cilantro, and mint; the soup has a great aroma and wonderfully garlicky flavor. It should appear in the rotation pretty regularly. We loved it. I love Israeli couscous… and this soup is so colorful. It’s delicious. I like the cayenne: it’s subtle — just a slight tingle in the back of the throat. Oh *that’s* what that is. I was worried I was coming down with something. Well, you’ll feel the blues if I take your soup away. You’re in luck, then. The recipe makes so much that we’re having leftovers tomorrow night! Heat the oil over medium heat in a large saucepan. Add the onions and carrots and cook until they are soft, about 10 minutes. Add 1/2 the garlic and the remaining ingredients to the pan. Bring the soup to a boil, add all but 1 tsp of the chopped garlic, then reduce the heat and simmer for 7-10 minutes, stirring occasionally, until the couscous is tender. Remove from the heat, stir in the rest of the garlic, and ladle into bowls. Serve with warm sourdough bread.